Final report card season is underway, and each Arcadia Unified school has made it onto the 2017 - 2018 Educational Results Partnership (ERP) Honor Roll. Of the nearly 130 school districts represented on ERP’s Scholar Honor Roll list, Arcadia Unified is the only school district to have each of its schools honored with this distinction. Sponsored by the Campaign for Business and Education Excellence (CBEE), ERP conducted an extensive analysis of student data for every public school in California, a process that included examining nearly 10,500 schools. From this research, ERP named 1,798 public schools to its 2017 - 2018 Honor Roll. 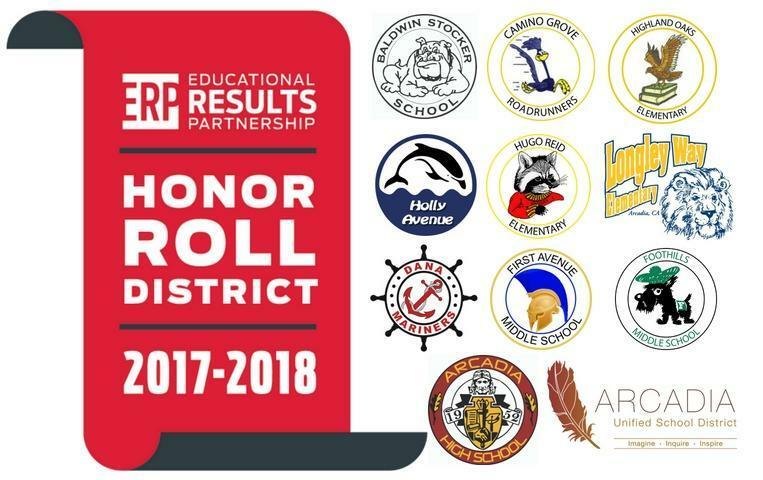 ERP’s Honor Roll includes Arcadia High, Baldwin Stocker Elementary, Camino Grove Elementary, Dana Middle School, First Avenue Middle School, Foothills Middle School, Highland Oaks Elementary, Holly Avenue Elementary, Hugo Reid Elementary, and Longley Way Elementary, making Arcadia Unified the only school district on the Scholar Honor Roll to have every one of its comprehensive schools receive this recognition. 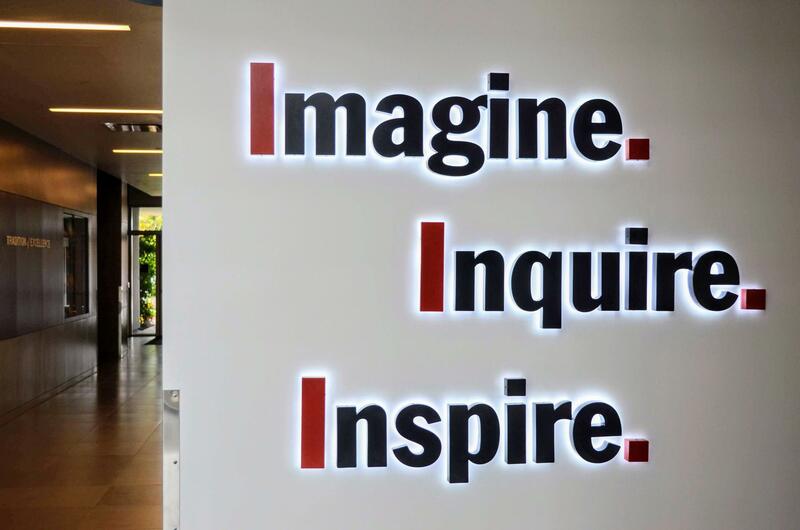 Arcadia Unified's tagline illuminated for visitors at the Arcadia Education Center. ERP is a nonprofit organization that applies data science to help improve student outcomes and career readiness. Its Honor Roll program recognizes public elementary, middle, and high schools that demonstrate consistently high levels of student academic achievement, improvement in achievement over time, and reduction in achievement gaps. In addition to the ERP Honor Roll recognition, Arcadia Unified is one of only five districts in Los Angeles County to be named to the prestigious 2018 AP® District Honor Roll, marking the second consecutive year that the district has received this honor. Additionally, Arcadia Unified’s Holly Avenue and Longley Way elementary schools were named as California Distinguished Schools for 2018. Similarly, Arcadia High was identified as being in the top two percent of the best public high schools in the state by Niche.com, with at least one student from the Classes of 2016 and 2017 being accepted into every Ivy League school in the nation. Among other honors, Arcadia Unified was also recently ranked by Niche.com as the Best Place to Teach in Los Angeles. For more information about the Arcadia Unified School District, visit www.ausd.net, and for more information about the ERP Honor Roll, visit edresults.org.